Take Havant / Langstone exit & continue to roundabout. Take Langstone (A3023) exit & continue for 3.6 miles to roundabout (this takes you through Langstone, over the bridge and onto Hayling). Take first exit onto Church Road & continue for 0.9 miles. Turn left onto Selsmore Road & continue for 0.8 miles. Turn left onto Southwood Road & continue for 0.8 miles. Turn left onto Nutbourne Road & continue for 0.1 miles. Turn right onto Sandy Point Road & continue for 0.2 miles. Turn left onto Bracklesham Road & continue for 262 feet. Turn left onto Itchenor Road & continue for 0.1 miles. 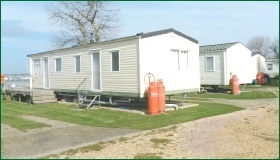 The Hollies Caravan Park is on the left hand side. The pitch fees for the 2019 season are £2,296. They comprise: Pitch Fee (£1,702.33), 20% VAT on Pitch Fee (£340.47); Rates (£175.48); Water & Sewerage (£35.52); and 20% VAT on Rates, Water & Sewerage (£42.20). Discounted £2,256 (a discount of £40 is offered to customers who pay the pitch fee in full before 1 March 2019). Direct Debit (eight monthly instalments of £287 from 1 March to 1 October 2019 inclusive). This is not a postal address and there is no office onsite. Address all enquiries to our Head Office. 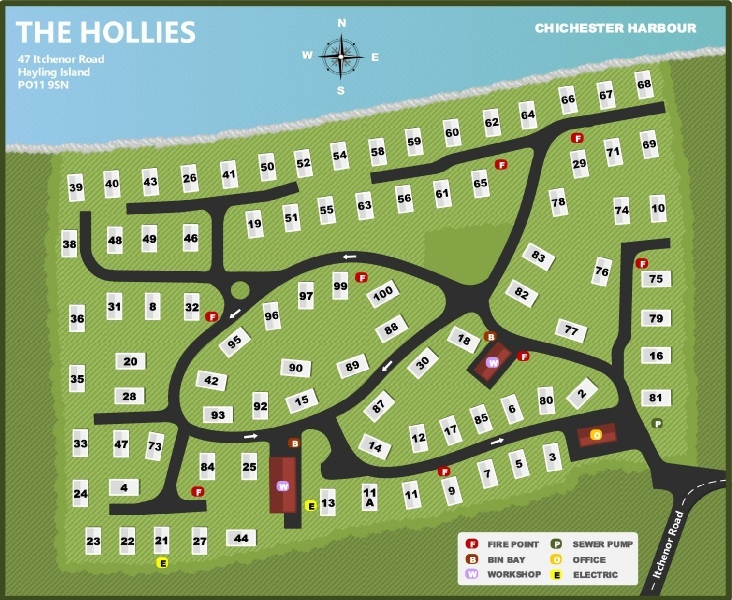 The Hollies is a long established park with eighty eight pitches. It lies alongside Chichester Harbour and is very popular with members of the nearby Hayling Island Sailing Club. The park is open from 1 March to 31 October. No extension to this period is available.